Want to learn more about using technology for learning and teaching? Look no further than this month’s Teacher’s Corner. In this month’s Teacher’s Corner we’ll investigate technology tools for both students and teachers. These tools can help students practice their English language skills and assist teachers in creating new content for the classroom. While some may be immediately useful in your classroom, others may take more time to practice and learn before becoming part of your teaching practice. These tools were selected for their flexibility and ease of use, but remember that each takes practice to learn. Don’t be afraid to explore these tools, be sure to practice using them before bringing them into the classroom, and don’t be afraid to make mistakes! Week 1 begins the month with a focus on technology for pronunciation practice. Many students struggle with a lack of opportunities to practice their pronunciation, so this week we highlight a variety of tools students can use both in class and at home. In Week 2, we explore tools that can support students during the writing process. In Week 3, the focus shifts to teachers with a tutorial on how to create screen recordings and screencasts with Open Broadcasting System. Finally, this month’s Teacher’s Corner concludes with a teacher-focused tutorial on Openshot, a free-to-use video editing software. Receiving enough pronunciation practice is challenging for English as a Foreign Language (EFL) students as the classroom often provides the only opportunity to practice and improve their pronunciation skills. Fortunately, a variety of new technology tools can provide our students with opportunities to practice pronunciation and receive feedback they need. In this week’s Teacher’s Corner, we highlight several tools students can use to practice their pronunciation skills outside of the classroom. Note: This week we focus on tools that students can use for self-study. However, if you would like to use these tools in class, the projector listed above will be needed. Note: These tools are needed if students will use these tools at home or in a computer lab setting. Read through all the materials carefully. Look at the sites listed above: Youglish, the Color Vowel Chart, and VowelCat. Take time to explore each of the tools to understand how they function. Read the materials in the links found at the end of this week’s Teacher’s Corner; they provide excellent resources in using the Color Vowel Chart in class. Youglish – Youglish is a unique search engine that scans online videos for specific words or phrases. For example, students can search the phrase “how’s it going,” and the website will return a variety of videos featuring that phrase spoken in authentic contexts. For teachers, the added bonus of Youglish is it only searches speeches, interviews, news programs, and other informational videos, so the material is always classroom friendly. Figure 1: Youglish displays and highlights words or phrases as they are pronounced. A transcript, or the written script of the words, is displayed below each video so students can follow along with the audio. The transcript is interactive, and students can click on unfamiliar words. When they do, the website displays a definition of the word and provides example sentences of the word in use. Students looking to hear pronunciations in specific accents can narrow their search so that only American English pronunciation is displayed. The Color Vowel Chart – The Color Vowel Chart is a web-based tool for students who wish to practice their English vowel pronunciation. Proper pronunciation of vowels is often indicated with the use of symbols in the International Phonetic Alphabet. These symbols can be confusing to students, so the Color Vowel Chart replaces them with words and colors featuring a specific vowel pronunciation. Figure 3. English vowel sounds in the Color Vowel Chart. On the Color Vowel Chart page on the American English website, teachers can find helpful guides on using the chart in class. The website also features a webinar teachers can watch to learn more about using the Color Vowel Chart in their classroom practice. VowelCat – Students looking to get more feedback on their vowel pronunciation can use the VowelCat vowel recognition software developed by Ohio University. By using VowelCat, students pronounce a vowel into their microphone and the software maps their vowel pronunciation to where in the mouth it is being pronounced. Figure 3. VowelCat helps students improve pronunciation by using visual feedback. The top left of the chart is the upper, front part of the mouth. The lower right of the chart is the lower, back part of the mouth. As students pronounce a vowel, their pronunciation is mapped onto the chart with a red ball. The red ball moves around the chart as a student pronounces specific vowel sounds. Students can then compare their vowel sound placements in VowelCat to the placements in the Color Vowel Chart. Color Vowel Chart and VowelCat, when used together, can provide students the proper pronunciation of a vowel and the opportunity to practice that pronunciation while receiving visual feedback on their performance. Teachers using technology in the classroom have many options for speaking and listening. However, we may not often think about how students can use technology to enhance their academic writing skills. In this week’s Teacher’s Corner, we will explore a variety of internet-based tools that students can use to support their English-language writing. From word choice to sentence structure, the tools below can assist students throughout the writing process. Explore each of the websites in this week’s Teacher’s Corner. Take time to use each of the tools to understand how they function. Graphwords – In American academic writing, students are encouraged to avoid using certain words that are commonly used in spoken English. For example, instead of using the word get in their academic writing, students should use words such as acquire, obtain, or receive. Knowing which synonym to use can be difficult, which is what makes Graphwords a useful writing tool. Figure 1. 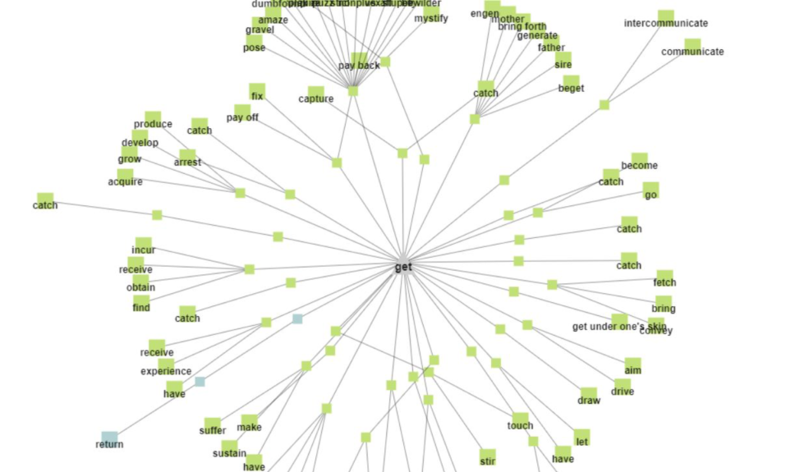 A Graphwords search for the word get. Graphwords is an enhanced version of a typical print thesaurus. Instead of looking through the book, students can enter a word into the Graphwords search box. The website will then create a web of related words color-coded by parts of speech, such as green for verbs, blue for nouns, and orange for adjectives. The lines between words show the connections between them. In the example above, the words capture and catch are connected together and then connected to the word get, showing these words have similar meaning. For students who are more visual in their learning, Graphwords can assist them in quickly finding new words to use in their writing. Hemingway – Of all American writers, Ernest Hemingway was most famous for his short, clear sentences. His writing style favored sentences that are direct. Many teachers in American academic writing programs also encourage this clear, direct writing, or conciseness, in their students’ writing. For many learners of English, writing concisely can be challenging, but the Hemingway writing tool can help students working to make their sentences simple and clear. Figure 2. The Hemingway software uses color coding to highlight suggestions for clarity. Students can copy and paste their writing onto the Hemingway website, and the software will analyze their writing style to suggest improvements. What makes the Hemingway website useful for educational purposes is that it does not correct students’ writing but only highlights writing that can be improved. The website color codes the students’ writing depending on the improvement needed. For example, passive voice verbs are highlighted in green, and adverbs are highlighted in blue. The website also provides a readability score for the writing, and sentences that are too complex or hard to read are highlighted as well to encourage students to clarify or simplify the sentence. 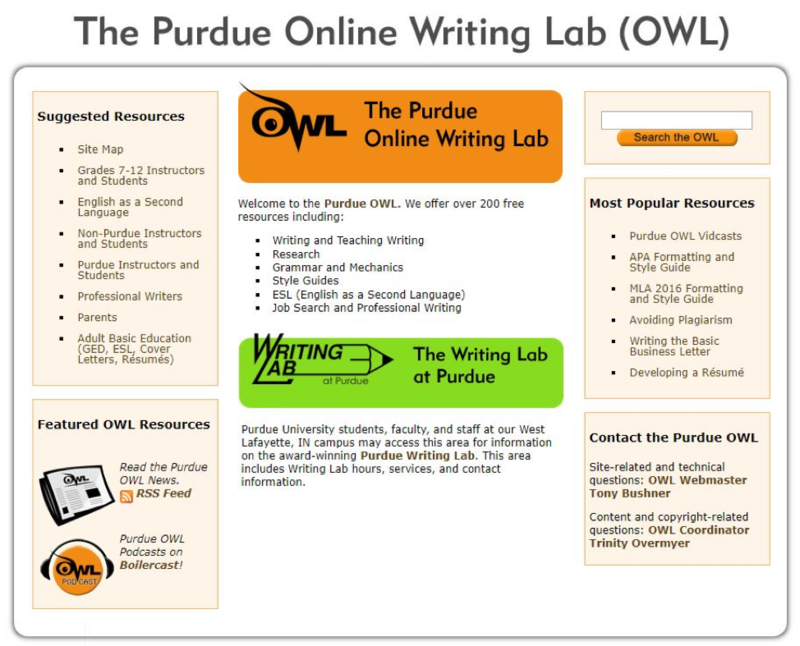 Purdue Online Writing Lab – The Purdue Online Writing Lab (OWL) features an extensive list of resources for students to improve their academic writing. The website contains writing guides for students at all levels as well as a series of resources specifically for English as a Second Language (ESL) learners. 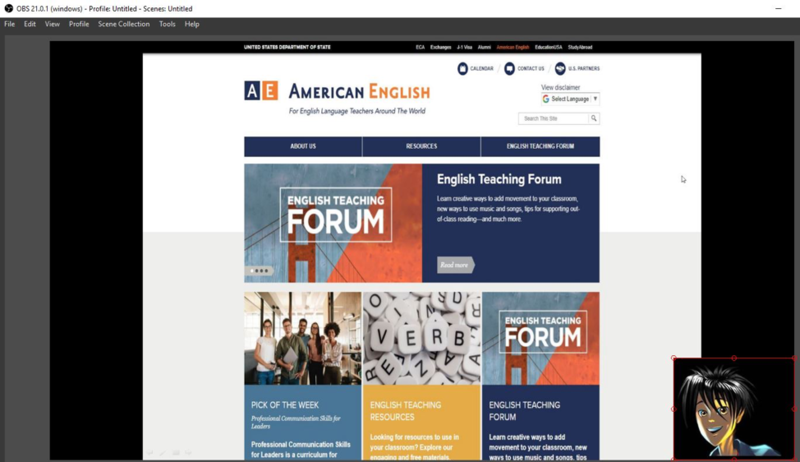 The ESL homepage has a number of worksheets on English grammar, including on adjectives or adverbs, how to use relative pronouns, and using verbs as gerunds or infinitives. Figure 3. The Purdue OWL has resources for writers of all levels. For more advanced students preparing for academic writing in the United States, the OWL website has an extensive series of resources on avoiding plagiarism, writing within specific style guides, and a series of videos covering academic writing for ESL learners. The OWL website also offers a list of professional development resources for teachers of ESL, including web links to professional organizations, and academic journals. This month’s Teacher’s Corner explores technology and how we can use it to enhance classroom practice. This week, we discover a way to create video content for the classroom with Open Broadcasting System (OBS), a free, open-source screen-recording software. 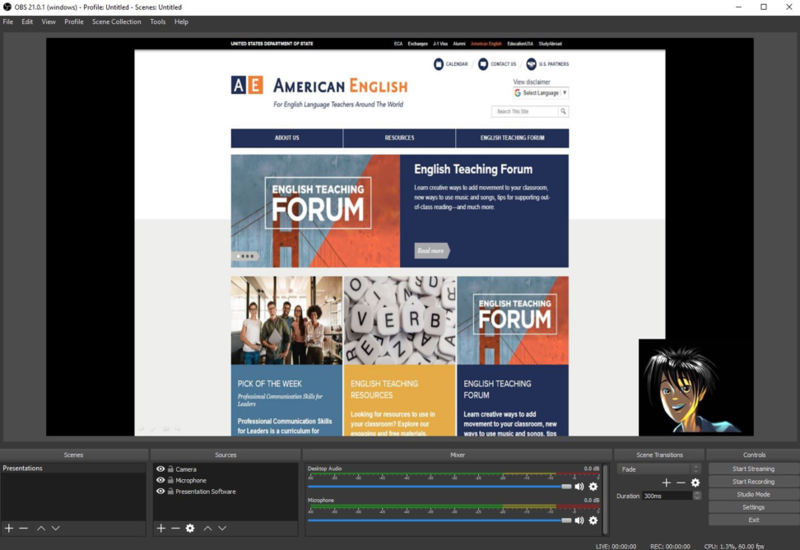 If you have watched the American English webinar series, you may already be familiar with screen-recording and screen-casting. With OBS you can record your own presentations similar to those in the webinar series to share with students and colleagues. Download and install the OBS software. Take time to explore the software to understand how it functions. Open Broadcasting System, or OBS, is an open-source recording and broadcasting tool that teachers can use for screen capture. Screen capture is the process of recording content on a computer screen. Using screen capture, teachers can create a presentation, record the presentation, and add the recorded presentation to online course materials. In the past, screen-capture software could be slow and difficult to run on older computers. However, OBS uses fewer computer resources, which makes it ideal to install on almost any computer. Because OBS is open-source, it is also free to use. Figure 1: The main screen of OBS. Users can create windows to show materials that can be recorded. Figure 2: This OBS tutorial covers the areas highlighted with red arrows. Note: Pay attention to the where the software is downloaded on the computer. You will need the file for the next step. Next, double-click on the OBS file you downloaded in Step 1, and follow the on-screen instructions to install the software. Open the OBS software and look at the bottom left corner of the screen. Here you will find two boxes: Scenes and Sources. These two boxes are the focus of the much of the tutorial. We will start with the Scenes box. Figure 3: The scenes and sources boxes allow you to easily prepare a screen recording. The Scenes box is where you can choose how material will be displayed in the center screen. Scenes are shortcuts for displays or types of recordings that you will frequently create. For example, if you often record presentations for an online class, you can create a scene that quickly turns on your microphone and camera and displays your presentation. 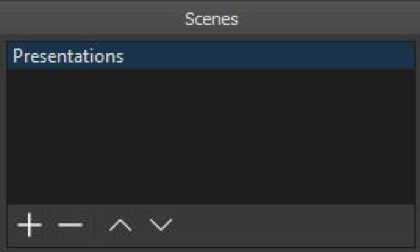 To create a new scene, click on the + button in the bottom left corner of the scene box. You will be asked to give the scene a name; in this example, the scene name is Presentations. Figure 4: Create a new scene by pressing the + button in the lower left. Once you create a scene, it is time to create the sources for the scene. Sources are the tools that create the different elements of the presentation. In this example, the scene has three sources: the camera, a microphone, and presentation software. Figure 5: Sources are parts that can be added to the content screen. Note: Remember that once you set up these sources, they will be saved as part of a particular scene. 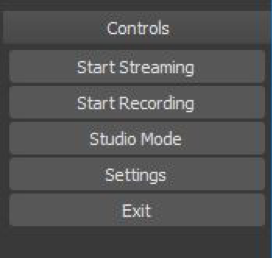 When you use OBS again, you will only need to click on the scene you want to use, and you will be ready to record! Once a source is added, it will be displayed as a red box in the large center screen in OBS. The sources can be moved around the screen. Figure 6: The camera source in the lower right can be made larger or smaller, or moved around the screen by clicking and dragging the box. Once the sources have been added and placed on the screen, you are ready to record. The record button for OBS is located in the lower right section of the software in the section labeled Controls. Figure 7: Click on the Start Recording button to begin recording your scene. After clicking Start Recording, the button text will change to Stop Recording. Just click the button again to stop recording. On a PC using Windows, the files are saved in the Videos folder. On a Mac, the files are saved in the Movies folder. On a Linux-based computer, the files are saved in the Home folder. For more on OBS, or to search for answers to specific questions, be sure to check out the OBS Help Page. For more ideas on using video content in the classroom, check out Using Original Video and Sound Effects to Teach English. This month’s Teacher’s Corner explores technology and how we can use it to enhance classroom practice. One way that technology can improve our classroom practice is in allowing new ways for teachers and students to create content. In this week’s Teacher’s Corner, we learn about Openshot, a free-to-use, open-source video editing tool that you can use to edit video tutorials or presentations for the classroom. Download and install Openshot on your computer. 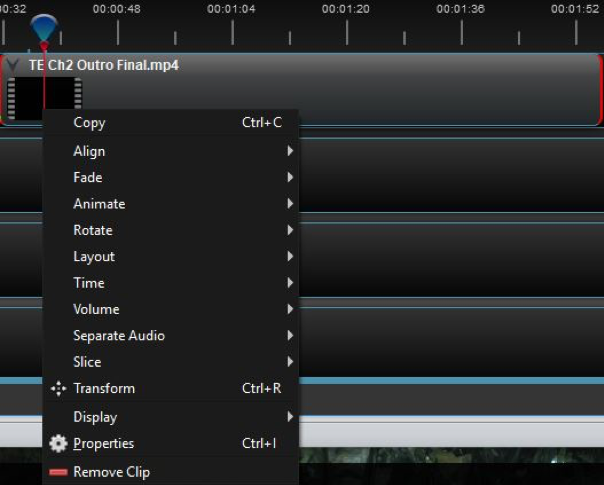 Openshot is an open-source video editing tool. In last week’s Teacher’s Corner, we learned about OBS software, which can record video. Openshot can be used to improve those videos by editing video, adding music, or creating opening and closing title slides. Openshot allows teachers to create good quality video content for classroom instruction or for students to access as part of an online class or for self-study. Openshot offers many features and options you can use to create video content for the classroom. This tutorial is designed to help you understand the basics, so for more information check out the Openshot User Guide. Figure 1: The main screen of Openshot, where users can add, edit, and preview videos. Figure 2: This Openshot tutorial covers the areas highlighted with red arrows. Project Files: This space will have the video files you add to Openshot. These are your original video files. These can be recordings taken from your phone, webcam, or camera. Video Preview: This section of the screen shows the video currently being edited. It allows you to check what you are working on to make sure it looks the way you want. Tracks: The tracks are the parts of a video. For example, you may have a video with music in the background. The video would be one track and the music would be a second track. Note: Pay attention to where the software is downloaded on the computer. You will need the file for the next step. Next, double-click on the Openshot file you downloaded in Step 1 and follow the on-screen instructions to install the software. Open the Openshot software. To begin, click on File in the top left corner of the screen. Then select Import Files. 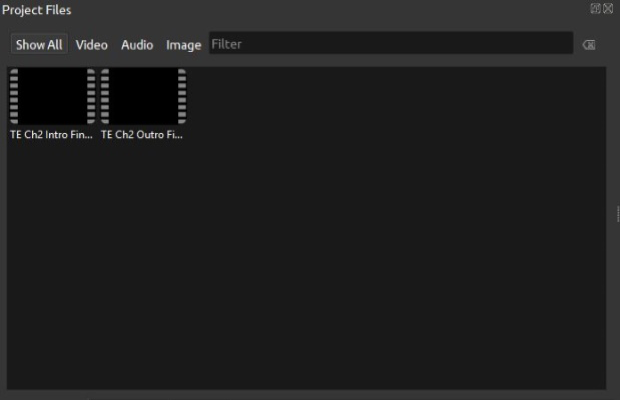 Figure 3: Use Import Files to add video you want to edit to Openshot. Import Files allows you to add your video files, music files, or images to Openshot. These are the files you will use to create a new video. When you import them, they will be added to the Project Files window. Figure 4: After you import files, they will appear the Project Files window. 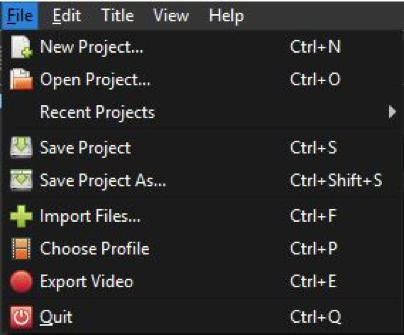 To begin building your new video, click on the files in the Project Files window and drag these files to the Tracks window at the bottom of Openshot. 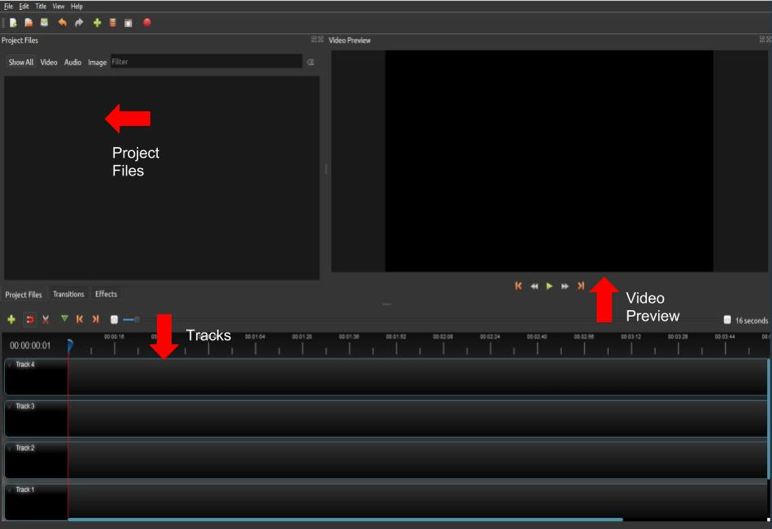 Figure 5: Adding files to the Tracks window allows you to begin editing them into a new video. Once videos are added to the Tracks window, you can press the space bar on your keyboard to play the video file in the Video Preview window in the upper right of Openshot. Figure 6: The Video Preview screen is where you can see your new video as you edit it. Videos in the Tracks window can be edited by dragging the slider (the red line with the blue icon at the top) to the section of the video you want to cut and right-clicking on the slider. Figure 7: Right-click the slider (the red line) to open the Edit menu. After right-clicking the slider and opening the Edit menu, select Slice. Slice allows you to cut a video into two separate sections. For example, if you want to remove the first minute of a video, you can slice the video where you want the video to start and then select Keep Right Side. Note: Editing video takes practice, like learning any new skill. Be patient, don’t be afraid to make mistakes, and remember that practice makes perfect! Figure 8: The Slice option allows you to cut a video in two pieces and then choose which part you would like to keep. Along with adding videos, images, or music files to the Tracks window, you can also add transitions to your video. Transitions are movements between edits that can make the change less noticeable. For example, after one scene or section, the video can fade out and the next scene or section can fade in. Figure 9: Under the Project Files window are three tabs. 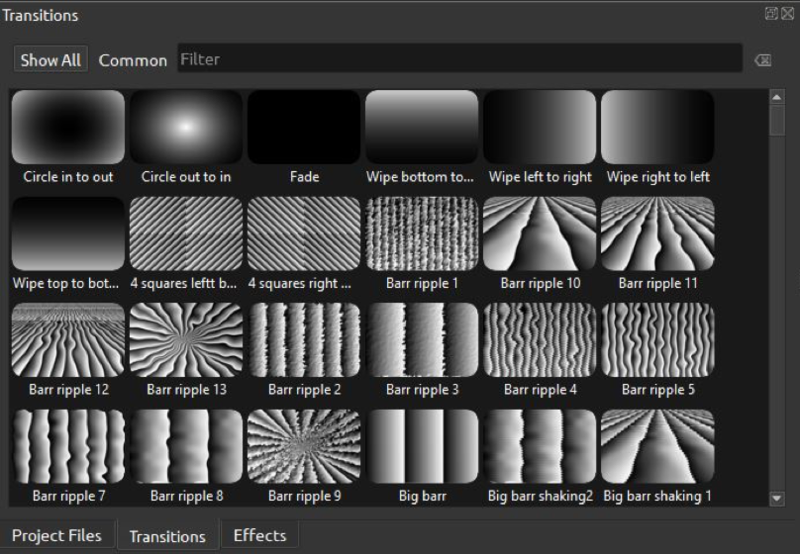 Click on these to find the transitions and effects options in Openshot. Both effects and transitions can be clicked on and dragged into the Tracks windows. Transitions can be added between video files in the Tracks, while effects can be placed directly over a video in the Tracks file. Once your video is complete, you can click the Files menu in the top left of the screen and select Export Video. 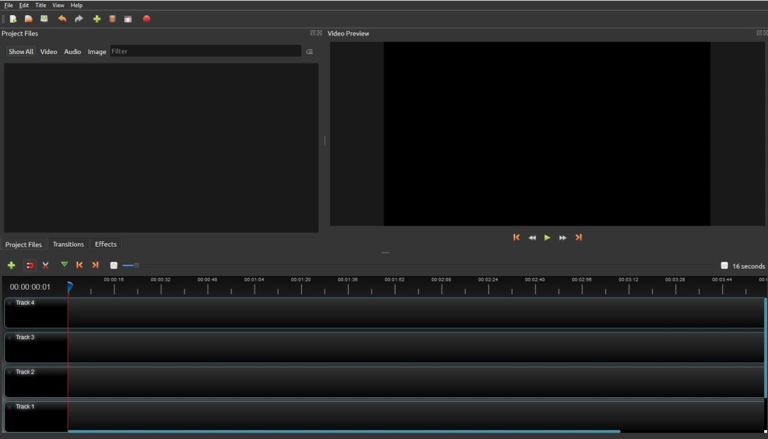 Figure 10: When you are ready to finish your video, select Export Video. After you select Export Video, a menu will open that allows you to choose where the video will be saved. 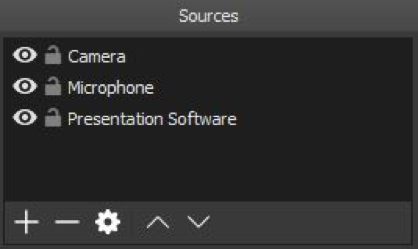 After selecting Export Video in this menu, the video will be created. Depending on how powerful your computer is, this creation may take several minutes.